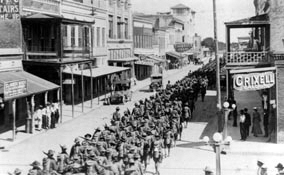 In July 1906, the U.S. Army stationed three companies of the all-black Twenty-Fifth Infantry at Fort Brown, Texas, adjacent to Brownsville. In recent years, southern Texas and the border region had seen periodic disturbances between American soldiers and local Chicanos who resented the military’s presence. Soon after their arrival, black soldiers began complaining of police harassment and civilian discrimination. On the night of August 13, a group of unidentified men fired more than a hundred shots into private homes and businesses near the fort, killing a young bartender. A well-organized citizens’ group accused the black infantrymen, prompting a U.S. Inspector General’s investigation directed by Major Augustus Penrose. Penrose later concluded that a handful of soldiers had knowledge of the shooting, but the shooters’ identities could not be discovered because the black troops refused to answer investigators’ questions. On November 6, claiming a "conspiracy of silence" to protect their guilty comrades, President Theodore Roosevelt announced the dishonorable discharges of 167 men in Companies B, C, and D. To avoid further trouble with border residents, Fort Brown and neighboring Ringgold Barracks were closed in October. African-American leaders nationwide condemned Roosevelt’s handling of "the Brownsville affray." One study suggests this event marked the beginning of African Americans’s abandonment of their historical loyalty to the Republican Party. From 1907 to 1910, the U.S. Senate reexamined the case and eventually allowed fourteen infantrymen to reenlist but upheld the summary guilty verdict. In the 1970s, the U.S. Department of Defense reduced the discharges to honorable status. James N. Leiker, Racial Borders: Black Soldiers along the Rio Grande (College Station: Texas A & M University Press, 2002).